Now that you’ve converted your old media to digital format and are enjoying all the new benefits that it provides, what should you do with your old media? For most people, the first instinct is to throw it all in the trash. Stop! Here are a few ideas for ways to reuse or recycling your old media. Our first advice to our clients is to hang on to their old media and store it in a safe, cool, dry place. You never know what the future holds. Technology is forever improving and in the future there may be solutions that can do an even better job of digitizing your old media. For example, years ago people paid to have their old 8mm film transferred to VHS and threw away the original film. Since then, telecine processes have improved dramatically which results in a much better transfer of the old film (not to mention optical discs and High Definition resolutions). 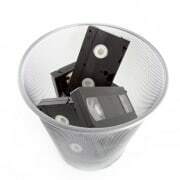 Another fear of only having a digital copy of your old memories and not a physical tangible copy can be the risk of bit decay or even the media you digitize to becoming obsolete. It’s possible that you digitize your photo collection and 50 to 100 years from now, that DVD isn’t readable, either because of a breakdown of the bits on the disc or computers at that time may not have the ability to read an old optical disc or USB drive anymore. Another option is to recycle your old media. 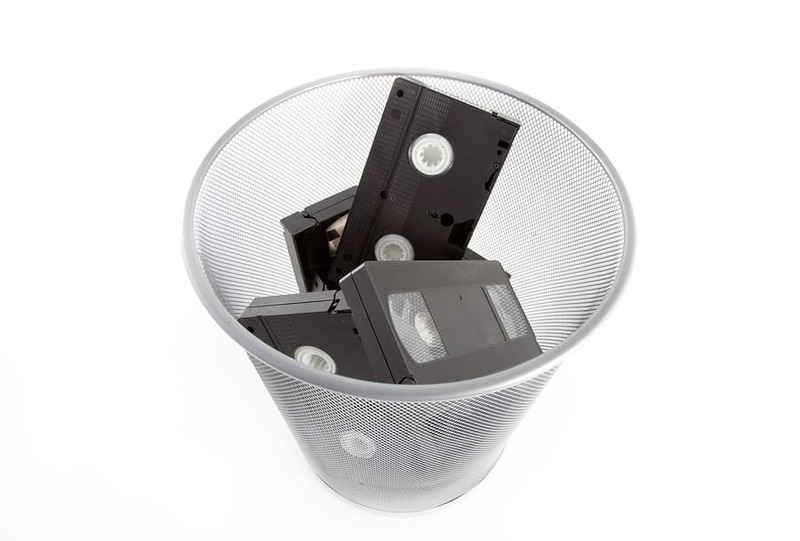 A lot of people don’t realize it, but their old VHS tapes and audio tapes are toxic. You shouldn’t just throw them in the trash. Check with your local community for recycle dropoff centers. One free local option in Minnesota is the Hennepin County dropoff centers. Some of the items they accept include computer disks, DVDs, CDs, Blu-ray discs, video cassettes, audio cassettes, game cartridges, Secure Digital (SD) memory cards, flash drives, plastic cases, jewel cases, ink jet & laser toner cartridges, and vinyl records. Another option is to use your old media for decoration or other utilitarian purposes. There is a whole slew of craft projects online that you can do on your own to re-purpose your old media, anything from 35mm Slide Curtains to secret VHS tape storage boxes. Be creative! A lot of people don’t want to burden others with their old stuff, but believe it or not, there are a lot of people out there that would love to have it. If you have old CDs or VHS movies that you think others could still get some use out of, donate them! Or if they are more personal like old family albums or home movies you don’t have room for, ask other family members if they would like to hang on to them for historical archival purposes. You’d be surprised at how willing people are to help preserve family history. Again, our first advice to is hold on to those old photos/slides/films, but if you don’t have the space then consider passing them along. Otherwise be sure to dispose of them responsibly. If you have any other tips for ways to dispose of old media, please leave a comment below!